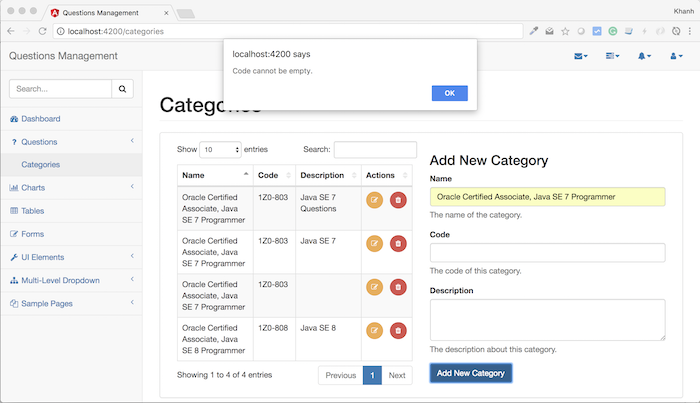 In the previous tutorial, we prepared the necessary information to build adding new category using Angular in the Frontend of our Questions Management application such as a CategoriesService for calling to the API Category Service, an object Category is used to store information of a category. Now we will go into the details of building this adding new category. Here, we have completed the building of adding a new category for the Frontend of the QuestionsManagement application. Let’s run the test. Adding a new category but do not enter the code. Previous Post: What is constructor in Java?